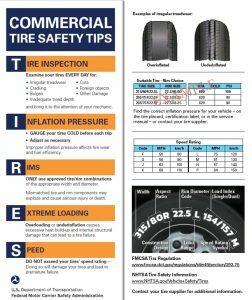 The Federal Motor Carrier Safety Administration (FMCSA) is concerned about commercial tire safety and has previously issued alerts to the truck driving jobs industry to raise awareness regarding summer tire safety issues. The National Highway Traffic Safety Administration’s (NHTSA’s) Office of Defects Investigations (ODI) have highlighted that exceeding tire speed ratings, increased front axle loads, and increased uptime/equipment utilization have led to increased tire failures on commercial trucks. For these reasons, FMCSA in collaboration with NHTSA, the Commercial Vehicle Safety Alliance (CVSA), and the Rubber Manufacturers Association (RMA) developed a visor card outlining tips for commercial tire safety.